This is a really interesting question for me... because I've worked in the toy industry as well as doing home creation of bears and other creatures. Now usually, being kinda lazy, I just start cutting felt into shapes and pinning them until I get the look I'm after. But I know for more complex sewing, in the industry, often a clay dummy is made - the piece lines marked out and then fabric or paper laid over and cut to shape resulting in a sewing pattern of sorts. Anyway, I was thinking of launching into that this week for a more complex design I have in mind but thought I'd ask some of you other creative folks how you go about figuring a new design. I really don't know many people who do their own designs in plush and always wondered how others approach this anyway. Do you fly by the seat of your pants? Do you meticulously measure each bit? Anyone care to weigh in? (Oh, I'm not trying to make anyone give up their secrets, this is just a general how-do-you, not detailed by any means). Ok, I'm one of those detailed designers. I, too, worked for toy companies at the beginning of my soft sculpture adventure. After I learned as much as I could about manufacturing from the companies I worked for, I started my own studio determined to create pieces that could never be duplicated by manufacturers. I had nothing against the wonderful companies I had worked with, I just needed to try my wings and expand my design ideas. I knew I wanted to create realistic animals. It helped that I had about 5 years of clay sculpture experience (mostly naked humans but I got the idea ;-). When I decided to design my cat I knew it would be difficult. Artists through history have had trouble showing realistic cats. I decided to take measurements of my real cats and incorporate these into a cat head sculpture. IT was a struggle, it took me almost a year to get it right and I had been used to designs taking about 2-4 weeks. Now when I have a difficult design problem I go back to measurements and clay sculpture. I use what is called draping to design the patterns. 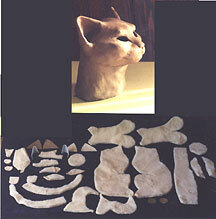 Here's an example using my cat sculpture. Your cats are fantastic! And yes, the draping technique is exactly what I was about to try. I've used it for costuming but not as much for my plush. I don't think my cat would put up with being measured... yours must be really mellow. Thank you for sharing your technique! Now I'm really excited to get on with it. Great topic! Usually I draw a side picture of the bear I want and go from there to create the pattern pieces. Then I experiment with the gusset to get the head shape I want. With my last bear (the realistic panda) though, I did a very similar thing to what Karen did with her head sculpture... only I didn't have any real pandas to measure. OK, you made me smile ANd I thought I was giving it all away Those 14 or so little pieces on the side are the pieces I created after draping over the sculpture with tracing paper and folding darts for all the curves. I'm not trying to keep it a secret. I know many artists use this technique. But I think if I explained it I would only confirm what people suspect "Man is she Crazy! I'd never do that!" Oh, that's a good idea! Geez, I never thought of drawing the head and then matching up pattern pieces... and I have no excuse, since I basically draw for a living. I saw your panda, it's fantastic. Thanks! :hug: I had so much fun making him! I have occasionally done a drawing as a starting point if I am working on something really different, but most of the time I just "wing it" or use earlier patterns I have designed as a starting point for proportions and then make changes according to what I have in mind - like a longer snout or shorter or longer limbs, etc. I fly by the seat of my pants, personally - I'm not a fab designer yet but I really enjoy just doing sort of wacky things and seeing what happens! The hardest part for me honestly is the head and gusset, messing with that I've found changes the personality of your bear quite a bit (and the face sculpting after) - ears are next, they can go through lots of tweaking and placement adjustment for just a little round shape! Arms and legs are next - they're my favorites to mess with because they're sort of simple and can really give a bear a personality all on their own. The body I'm still figuring out to be honest - I'm keeping that sort of simple. I'm new at this, so the body is still just one once-designed shape for me just yet! I take a pattern from drawing or photos. I am a bit hit and miss really. When I designed my cats I wanted something that had the essence of a cat yet still looked like a Three O'Clock cat...so not realistic at all really. 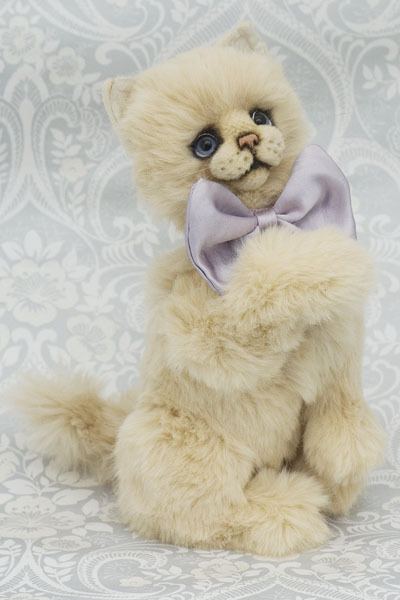 I didn't just want a bear with pointy ears though ..so I set about making a kittenish piece. I have made 3 now and they all get changed ..and I am still unhappy with the body..it needs much work in my opinion. 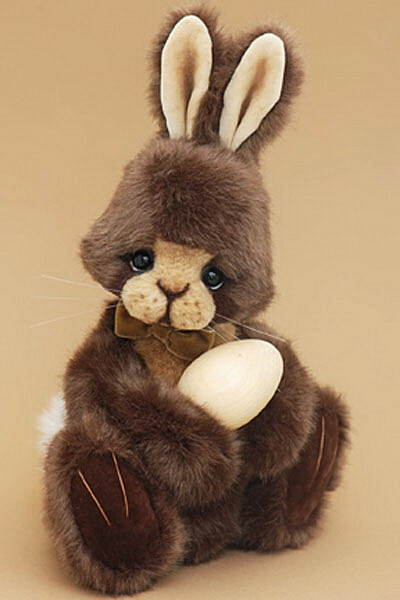 I was the same when I designed a rabbit...it had to be rabbity..but not real. I did a squirrel once whose head ended up in the dog basket because the squirrel design was just soooo hard..it drove me insane. The way I think of it ..in a simplistic way is that , ( and I am not drawing comparisons in levels of talent here by the way) if you look at Beatrix Potters line drawings, they are so simple and yet she captured the 'feel' of each creature..without the complexity. I make that a challenge each time but whether I succeed is for others to judge. Here are my attempts at cats , rabbits etc...I am working on other stuff at the moment because I'm in the doldrums at the moment designwise. I really enjoy the pattern side of making rabbits. When I first started it was just trial and error but when you get something near to what you want it gets easier. I have altered my pattern from when I first started and it has changed quite a bit. I am now re doing it and using various methods. I soft sculpt parts and I also use the laying over method. It's very challenging but thats the fun part. I had so many people asking I started a tutorial - which I really should finish - that shows my bizarre way of designing. I sketch out a rough of what I see in my head then work out the basic shapes that make it up and design from there. They usually work out the way I want, with a few exceptions. KJ Lyons: your cats are utterly gorgeous! Seriously.. when I'm designing something new I start with the head as well. I like to draw the side first and then experiment with the gusset til I get the look, hopefully, that I'm trying for. I don't do much about the body and limbs until the head is sewn up cause if I don't like the head I don't need the rest. I have more than one design method but one of my design methods may be a little unusual. I am self taught from the late 1980's and my method of teaching myself was to study every good pattern that I could get my hands on at the time....maybe that is why, to this day, I think pattern first. I remember that I used to even dream about different pattern designs and 2 of my favorite bear designs in the 90's came to me in my dreams...on the same night! When I woke up in the morning I quickly drew out those patterns before I forgot them and to my surprise when I made my first bears from those patterns they were wonderful and perfectly proportioned. Oddly enough even now when I have an idea it can still be just the pattern. I guess I'm designing from the "inside out". LOL! The nice thing about designing this way is that I'm always surprised and I'm always excited to see my own finished product because a lot of the time I don't have a clue about what it will look like until I'm finished. Of course, I also design in a more planned and controlled way but from the inside out method is still more fun since I'm rarely disappointed because when I start with the pattern idea first I never have a preconceived idea about what the finished bear should look like... so it's always a surprise. It's great hearing how everyone goes about designing their plush. This is how I started designing my bears also -- I cut shapes and then wait-and-see what turns out. Have to admit that seems to work a little better for you them me as your designs are incredible. I never would have guessed you were going the "happy accidents" route on anything. Wow!! Nice to know everyone seems to use a range of design methods, not just one. I guess there is no wrong way to make a bear so long as the end results are interesting. I guess there is no wrong way to make a bear so long as the end results are interesting. You're so right! Just like there are so many techniques to actually make the bear, there are so many ways to design - there's lots of ways to "peel an orange"! Keep having fun with it -I think that's the important part. when I have her the way I want her then I draw out on typing paper the limbs the way they will have to be for ease of sewing and still getting the look I want- then from each limb I extrapolate the pattern and sometimes make a plastic template pattern, if I think I will make more than one....but I never do so why I bother is beyond me. Are you lookiong for a better design method? Speaking of design, I realized to day just how loosely I approach it. I felt like making a monster, and my friend has been after me to make some "cheepy" pancake dolls to sell on my new Etsy store for folks who don't want to throw down for a mohair or alpaca bear/rabbit/cat, so I figured that would be less taxing then redesigning my 1960's inspired deer pattern. Anyway, I started out needle felting a face, but, as usual when I needle felt I got bored an hour in and resorted to paint, flat felt and some needle sculpting. They I started hacking out some body shapes in fur and felt... well, what can I say good thing I don't intend to make this a series because I didn't bother to cut pattern pieces at all. The whole thing is free form. Maybe I'll just declare all my plush to be one offs like I do with my sculpting. Ha!